Our search for the top Sport Ngin tournament sites not only revealed some of the best design and content we’ve seen – in any category – but also took us to some of the nation’s most beautiful and popular destinations. Our cyber journey took us to the frozen lakes of Minnesota and New Hampshire, the breathtaking mountains surrounding Lake Tahoe, the soccer fields on the shore of Lake Michigan in downtown Chicato and one of the largest soccer facilities (52 fields and counting) in the world. 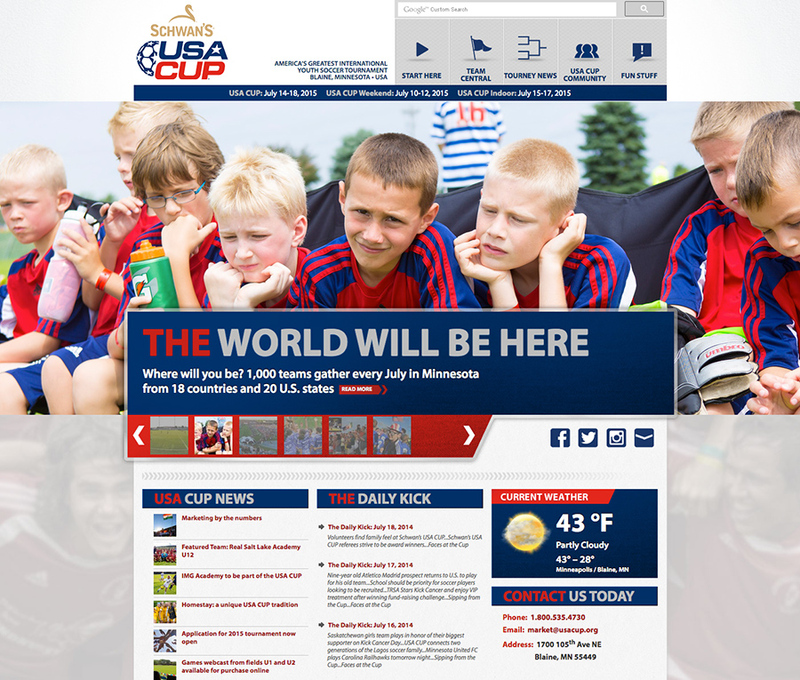 That massive soccer facility, part of the National Sports Center in Blaine, Minn., is showcased on the incredibly well-designed and content-rich USA CUP site. More youth soccer (in Chicago), pond hockey (in two locations) and youth lacrosse (in the Lake Tahoe area) were the other sports that cracked our top 5. We graded more than a dozen of the top tournament sites on the platform, assigning points in categories such as Design, Navigation, Content, Previous Results, History, Photos, Videos and more. The sites that rose to the top were the ones that coupled a clean, concise home page design (making for a striking first impression) with the greatest depth and variety of content. (it has a stunning 52 fields). are clean and deftly organized. The labeling of the site's five major categories is unique, with headers such as Start Here and Fun Stuff. Each category has an expanded drop down that includes the sub navigation links and a photo. and specify the age group and the flight. 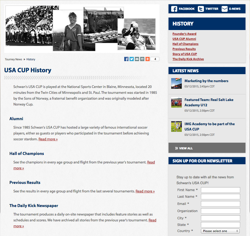 A section titled the “Story of Schwan’s USA CUP” details the 1985 origin of the event, which was founded by the Sons of Norway, a Twin Cities fraternal benefit organization. A staff page provides the names and contact information of the folks running various aspects of the event. International soccer legend Pele electrified a Metrodome crowd of 25,000 in 1992 when he jogged onto the turf during the opening ceremonies. 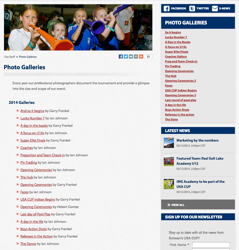 Not only are there links to photo galleries dating to 2010, but the galleries are organized by specific topics or themes such as Pin Trading, Coaches or A Day in the Life. The minimalist design – wooden planks serve as the background – is befitting tournament that uses wooden boxes for goals and humans as Zambonis. The emphasis of the home page content changes depending on the time of year, and is heavy on videos and photos during and after the event. There are just five categories, other than the home page button, in the top navigation that also includes a handy site search. 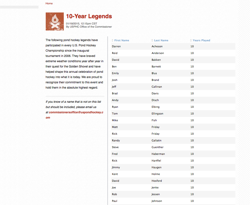 Past tournaments are listed in the History section, and all but the inaugural 2006 event has a page that lists the champions from that year. Complete team roster lists, scores, pool play standings and championship round brackets are available for several years of the event. 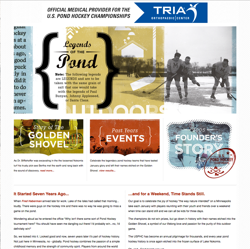 The robust history section includes a page devoted to the origin of the Golden Shovel that goes to the Open Division’s championship team and a Legends of the Pond page that includes more than a few tall tales. 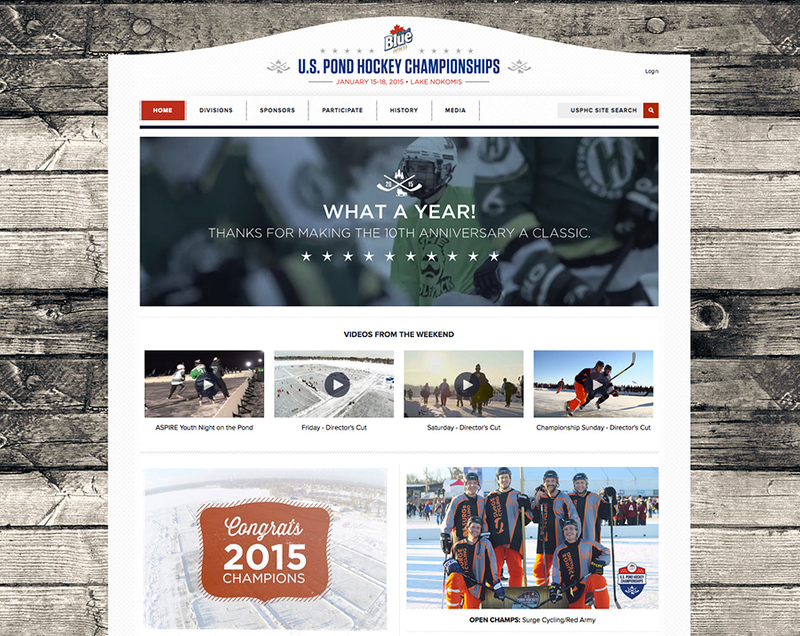 A news article displays all the players who have participated in all 10 U.S. Pond Hockey Championships. Legendary pond powerhouse Wright Homes has five Open Division championships but never back-to-back titles. Each year, rosters are listed for every team in each division, making it easy to search for former high school or college classmates or scout the opposition. An international youth soccer tournament, the inaugural KICS Cup was held last year and attracted more than 1,000 players and teams from around the world. China, Ethiopa, Italy, Columbia, Guatamala and Puerto Rico were among the countries represented last year in the event, which is open to boys and girls ages 8-16. Games are played at Chicago Park District locations. The site’s home page offers an impressive mix of news, oversized photos and front-and-center information about the event. We also like that the Register Now button occupies a can’t-miss position in the banner. 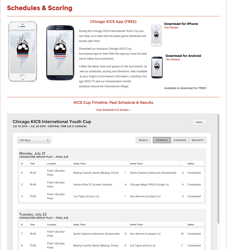 The top navigation includes some helpful links targeted for newcomers to the event and Chicago, including a Family/Guests tab and an Ala Carte tab that lists all the events associated with the tournament. All teams, games, scores, standings and brackets from last year were entered using Sport Ngin’s Tournament software and are available for review on the site. The same information was pushed out to the event’s free app. The site’s Contact Us section includes phone, email and mailing address information as well as listings for the tournament directors and concierge services. There is no deeply reported history section – understandable given the event is in just its second year. 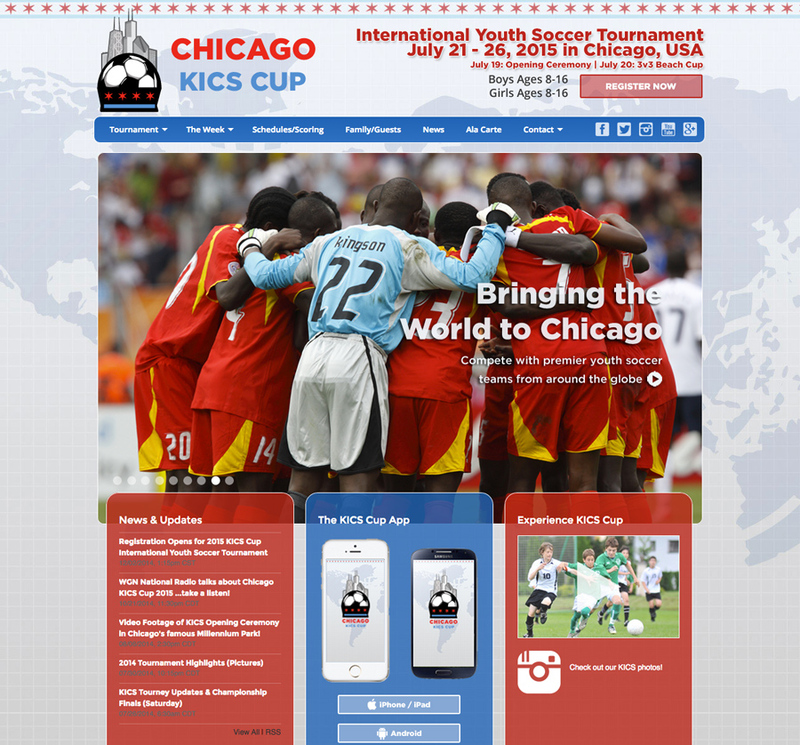 KICS is an acronym for Kids in Chicago Soccer. The Field Locations page provides a detailed look at the venues used for the event, including scenic Lake Front Park on the shore of Lake Michigan. The first Pond Hockey Classic was held in 2010 in Meredith, N.H., on Lake Winnipesaukee. The event, which attracts 1,800 players, has been such a smashing success that other tournaments under the Pond Hockey Classic banner have been added in Vermont, Montana and New York City. 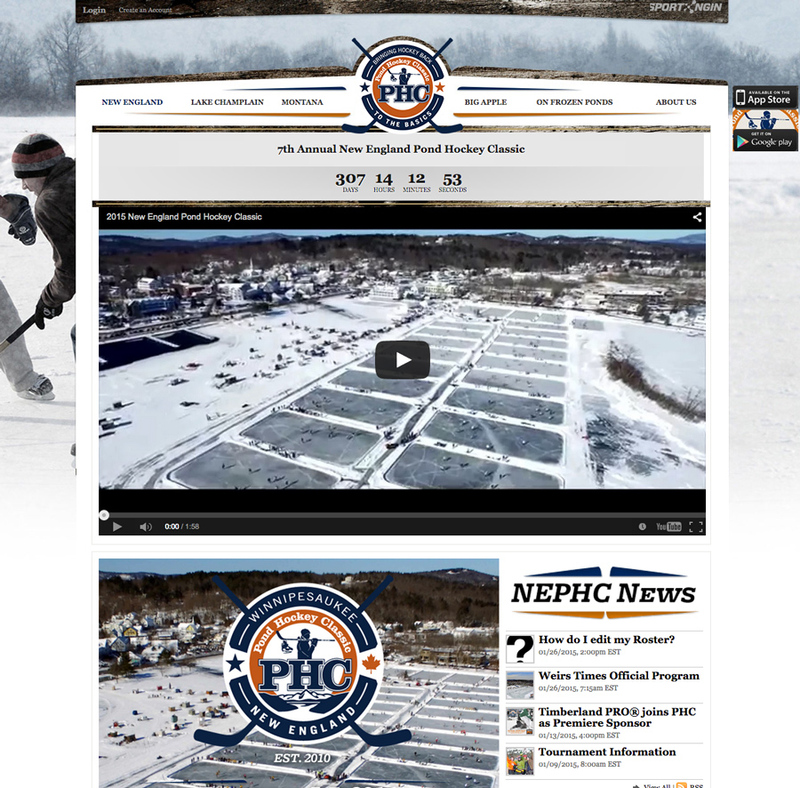 The video at the top of the New England pond hockey site, right under the countdown to next year’s event, offers a spectacular overview of the event. More high quality videos, from each day of this year’s event, are found lower on the page. 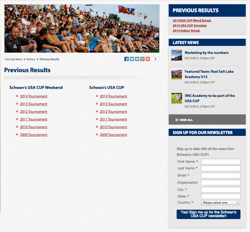 The Schedule & Results page lists the results and brackets from each of the divisions in this year’s tournament. The Lake WinnipeHockey’s (Get it? 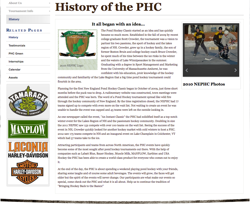 The lake’s real name is Winnipesaukee) Cup page tells quite a tale about the rich history of pond hockey on the lake and, at the bottom, lists all the champions from previous years. Tournament founder Scott Crowder is the son of former Boston Bruin Bruce Crowder. 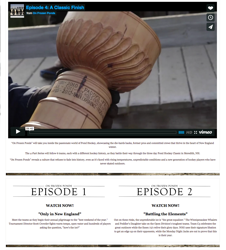 The On Frozen Ponds link in the top navigation brings viewers to a landing page for the four-part National Geographic series that followed six teams as they battled their way through the event. The series is must-see hockey. Location: Truckee and Tahoe, Calif. 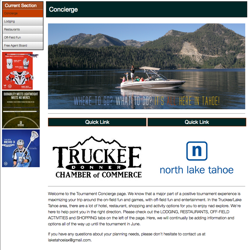 The inaugural Lake Tahoe Summit Lacrosse Classic was held last year just a few miles from scenic Lake Tahoe in Truckee, Calif. The youth tournament attracted more than 60 teams from across the nation and crowned champions in eight divisions. The ice-blue waters, the snow-capped mountains, the pine trees – what is there not to like about Lake Tahoe? The beauty of the region is captured in the background of the website, one of the most eye-catching on the entire Sport Ngin platform. Several pages display photos of the gorgeous scenery in a not-so-subtle attempt to draw teams to the event. The simple top navigation doesn’t overwhelm with options, and larger call-out buttons are used lower on the page for Divisions and Lodging. The huge Click Here to Register! graphic near the top of the page can’t be missed. Navigating to last year’s results requires a series of clicks, but all the information is accessible. The About page includes an article about the origins of the event, and buttons at the bottom provide contact information for key staff members. 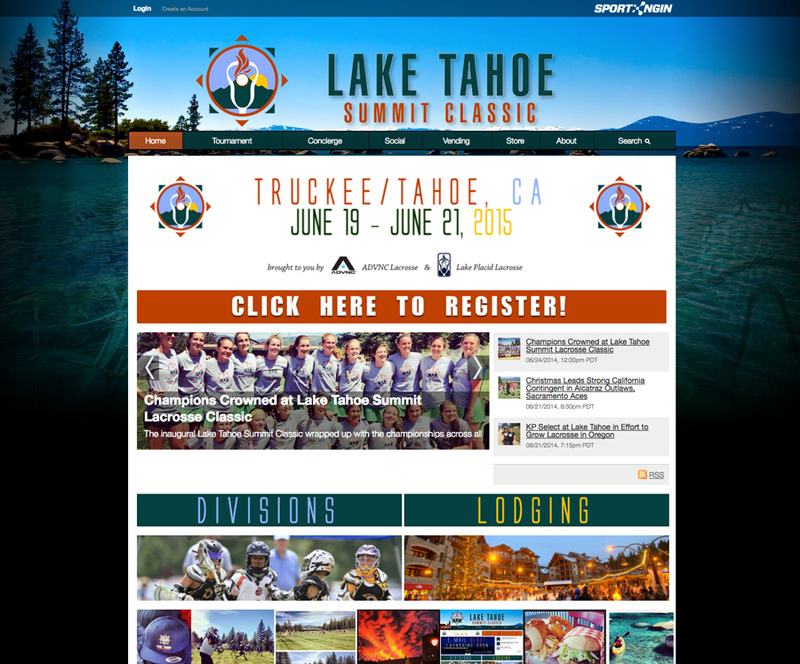 ADVNC Lacrosse and Summit Lacrosse Ventures partner to host the Lake Tahoe Summit Classic. 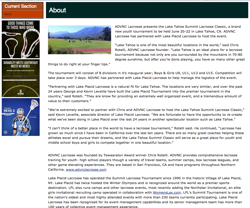 ADVNC Lacrosse was founded by a Chris Rotelli, a former University of Virginia standout who in 2003 won the Tewaarton Trophy as the nation’s top collegiate player. An active Free Agent Board gives individual players the chance to catch on with teams participating in the tournament. Wondering why your site didn't make the list? Want to put your site in the Top 5? Contact loren.nelson@sportngin.com for a free consultation.